This past week, tens of thousands descended upon Washington, D.C., for the forty-fifth year in a row to demand an end to legal abortion. Every year since Roe v. Wade, the March for Life has served as a public witness to the whole nation of the millions killed in the womb in the name of sexual freedom. But this year, the March for Life was immediately followed by another and very different demonstration. The Women's March--which gained notoriety in 2017--took to the National Mall in support of causes that have expanded far beyond just women--and they're all progressive causes. But the central cause of the Woman's March is unquestionably abortion. The Women's March started as a protest against President Trump and his checkered history with women. But since then, it has morphed into an openly pro-abortion demonstration. There is no room at the event for any other view, as Kristen Day, executive director of Democrats for Life of America, found out last year when she was chased off for holding a pro-life sign. Devotion to abortion has hijacked not only this women's movement, but an entire political party. Democratic delegates cheer Roe v. Wade at their national conventions and have officially adopted abortion at any time for any reason into the DNC platform. 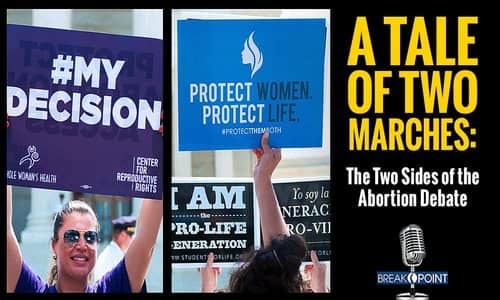 Funding international abortions was among the first priorities of the new majority in the U.S. House this year, and supporters of the so-called "right to choose" have gone from defending abortion as a tragic necessity to openly celebrating and even joking about it. Shout Your Abortion is an organization that produces videos and testimonies from women in an effort to remove the "stigma" of abortion. In a recent sickening video, the founder of Shout Your Abortion sat down with middle school children and explained to them why killing an unborn baby is just like having a bad "dentist appointment." She described to two young girls how an abortionist "sucked the pregnancy out" of her womb, and shot down another student's suggestion that adoption might have been a better option. If you're not already queasy, the founder of Shout Your Abortion plans to keep on shouting in a soon-to-be-published children's story book. Even Planned Parenthood has gotten bolder about what they do. They've now dropped their long-used strategy of insisting that dismembering babies is just "3 percent" of their business. But it wasn't because they were repeatedly called out for their dishonesty (even the Washington Post, by the way, gave them three Pinocchios for that claim). No, earlier this month, Planned Parenthood's new president, Leanna Wen, announced on Twitter that providing and expanding abortion is her organization's "core mission." The pro-choice movement is now officially and unashamedly the pro-abortion movement, and they will not tolerate anyone unwilling to join their celebration of death. Pro-life activist Lila Rose thinks this has a lot to do with how hard our movement has pushed their movement. She told me this week on the BreakPoint Podcast that abortion proponents are on the defensive right now. With two new pro-life justices on the Supreme Court and another looking increasingly likely, it's no wonder. But something deeper is fueling the anger on display at the Women's March and by abortion defenders. On Tuesday, Lila and several other leaders at a panel discussion in Washington, D.C., suggested that 45 years and sixty million abortions have left behind a wake of wounded souls. In other words, all this shouting about abortions is only an attempt to drown out the voice of conscience welling up inside millions of men and women who have made a terrible choice. And if that's true, neither the pro-choice demonstrators at the Women's March nor the execs at Planned Parenthood are really our enemies. No, they're broken people in need of repentance and forgiveness. So as we march for life in Washington for the 45th time, let's pray that God uses our efforts to break the hold of death on our culture and our laws, but also to usher the many victims of abortion into eternal life.